A top Internal Revenue Service deputy switched course on Wednesday and agreed that an information technology contractor who allegedly misrepresented himself to qualify for preferences should be denied a pending contract. The statement came during a hodgepodge hearing of the House Oversight and Government Reform Committee that touched on everything from the scandal at the IRS tax-exempt division to the 2010 Affordable Care Act to the value of contract set-asides for enterprise zones and contractors with disabilities. Beth Tucker, deputy IRS commissioner for operations support, backed off of previous statements and said her procurement team is likely to cancel the part of a large software contract destined for Strong Castle/Signet Computers, given new information made available this week by congressional investigators detailing false statements about the friendship between the company’s CEO and Gregory Roseman, recently relieved of his post as deputy director of IRS Enterprise Networks and Tier Systems Support. The two also exchanged at least 350 text messages that agency supervisors and lawmakers called “offensive and unprofessional” in using anti-gay slurs against IRS colleagues. This was done while Roseman was allegedly steering a contract toward Strong Castle chief executive Braulio Castillo, who stands accused of making false statements about his physical disability and the qualifications of his firm. Committee Chairman Rep. Darrell Issa, R-Calif., on Tuesday released a report on the panel’s three-month finding that Castillo’s company had only $250,000 in annual revenue, but that his personal relationship with Roseman -- they were college roommates -- “facilitated” consideration for contracts worth up to $500 million in just six months. It also found that Strong Castle/Signet Computers “gained an advantage over competitors by gaining a socioeconomic HUBzone business designation by making false representations to the Small Business Administration. Castillo is also said to have represented his military prep school experience as military service and to have cited a 27-year-old college football injury to his foot as qualifying him as a contractor with a disability. 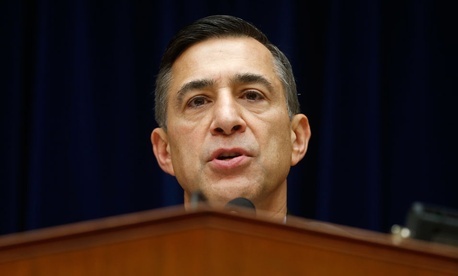 Issa said the conduct “exposes a staggering vulnerability in the IRS acquisition process that, frankly, begs the question of whether we can afford to have the agency implement Obamacare,” noting that the agency’s recent budget request for 2,000 new employees would cost $500 million, about what the disputed contracts are worth. Referencing the 30-day review report on biased handling of applications for tax-exempt status issued on Monday by acting IRS Commissioner Danny Werfel, Issa said, “Unfortunately, this completely undermines the IRS narrative” that the agency’s management problems are confined to its tax-exempt division. Roseman invoked his Fifth Amendment rights and did not answer questions other than to confirm his previous title at IRS. Castillo testified that he “never received any preferential treatment” and “competed fairly for every contract received” while also making a “meaningful contribution to the IRS,” with whom he has worked, he said, for 15 years. He said he worked for the contractors with guidance from the Small Business Administration, and that he has cooperated with the investigation. In response to Issa’s characterization of the IRS as a “troubled agency,” Tucker began her testimony by saying how proud she was to have spent 29 years at the IRS “alongside dedicated employees who are vital to keeping our government strong.” She challenged Issa’s characterization of Strong Castle’s contracts as being worth $500 million (as did Castillo), calling it a small subset of a larger contract that is being awarded mostly to IBM. She said when Issa’s committee first contacted her in February she referred the matter to the Treasury Inspector General for Tax Administration, whose probe of the Strong Castle case continues. But on Tuesday, on receiving more details, “we found the text messages from Roseman’s personal phone, and they were deeply disturbing and so we took steps to reassign him,” she said. “We are now taking steps to sever IRS from any ongoing business relationship with Strong Castle,” Tucker said, adding that she is conducting a “top to bottom review” of her unit’s business practices and staffing and has asked the Treasury Department to more deeply review IRS set-aside programs for helping small businesses. Treasury in 2012 named Strong Castle/Signet Computers as Small Business Prime Contractor of the Year, a decision, Tucker stressed, that the IRS was not involved in. Issa’s panelists also included specialists from SBA, the Veterans Affairs Department and the General Services Administration. Michael Chodos, associate administrator of the SBA’s Office of Entrepreneurial Development, reported that Castillo’s company in January had been decertified.